Evolution is not a creative work force. It is not working for the progress. Evolution helps some individuals in a population to survive. They reproduce more effectively than others in the population. It causes changes in gene frequencies. Some factors do not follow hardy-Weinherg assumptions. Therefore, gene frequencies are changed from one generation to the next. It causes evolution. The change in gene frequencies by chance is called genetic drift. Chance plays an important role in maintaining a gene in a population. Chance becomes more significant in a smaller population. Chance encounters reproductive individuals. Thus it promotes reproduction. Some traits of a population do not survive. But they .come in the gametes by chance involved in fertilization. Chance events influence the frequencies of genes in populations. It causes genetic drift. The gene frequencies are changing independently of natural selection. Therefore, genetic drift is called neutral selection. The process of genetic drift is similar to flipping a thin coin. There is equal chance of getting a head or a tail. There are almost 50:50 ratios of heads and tails in large number of tosses. The ratios are disproportionate in only 10 tosses. The ratio may be a 7 heads and 3 tails. Similarly, there are two equally adaptive alleles. One of these two alleles incorporated into a gamete by chance. Therefore, it is transferred into a second generation. Thus both alleles have equal chance. 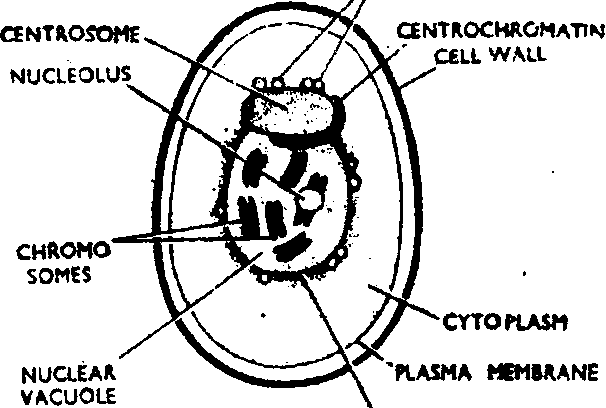 But meiosis causes uniusual proportions of alleles in gamete in a small population like tossing a coin. Suppose both alleles have equal fitness. These chance events may increase or decreases frequency of a particular allele. Inbreeding is also common in small populations. Genetic drift and inbreeding reduce genetic variation within a population.Suppose mutation introduces a new allele into a population. That allele is less adaptive than existing alleles. Genetic drift may help the new allele to establish in the population. Or the new allele may be lost due to genetic drift. Thus Elardy-Weinberg equilibrium does not occur due to genetic drift in small populations. Genetic drift in a new colony is called founder effect. For example. a few individuals from a parental population colonize new habitats. They do not carry all the gene pool of their parental population. The founding individuals develop new colony. It has a distinctive genetic makeup. It has far less variation than the larger population. 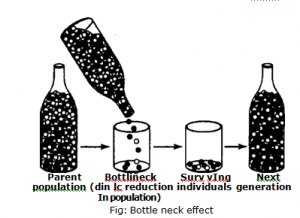 This form of genetic ,drift is called founder effect. The Dunkers (a tribe) of eastern Pennsylvania is an example of founder effect. They emigrated from Germany to the United States early in the eighteenth century. They did not marry outside their sect due to religious reasons. Certain traits like ABC blood type were examined in their population. It shows that they have very different gene frequencies from the Dunker populations of Germany. It is believed that genetic drift or chance removed certain genes from the founding individuals of the Pennsylvania Dunker population. Therefore, next generations of the Dunkers have different gene frequencies than the German Dunkers. Fig: Bottle neck effect (Human activities on Cheetah) Northern elephant seal is also an example of bottle neck effect. They were hunted to near extinction in the late 1800s. Law was enacted in 1922 to protect the seal. Now their population is greater than 100.000 individuals. But they have low genetic variability in the population. Changes in gene frequency due to migration of individuals are called gene flow. The Hardy-Weinberg theorem assumes that there is no immigration and emigration. Immigration means that no individuals enter a population from the outside. Emigration means that no individuals leave a population. Immigration or emigration upsets the Hardy-Weinberg equilibrium. They cause changes in gene frequency (evolution). Some natural populations do not have significant gene flow. But most populations have significant gene flow. Changes in the Structure of genes and chromosomes are called mutations. The Hardy-Weinberg theorem assumes that no mutations occur. Or mutational equilibrium exists in the populations. However mutations are a fact of life. Mutations are the origin of all new genes. They are source of variation. These variations may prove adaptive for an animal. Mutation counters the loss of genetic material from natural selection and genetic drift. It increases the chance al variations in the population. These variations allow a group to survive in future environmental shocks. Mutations are always random. All mutations are not useful. Organisms cannot filter harmful genetic changes from advantageous changes. The effects of mutations vary enormously. Most mutations are deleterious. Some mutations are neutral. Some mutations are harmful in one environment. But help an organism to survive in another environment. A case in which mutation from the wild-type allele to a mutant form is balanced by mutation from the mutant back to the wild type is called mutational equilibrium. It gives that same allelic frequency as was without mutation. However mutational equilibrium rarely exists. The measure of the tendency for gene frequencies to change through mutation is called mutation pressure.